A wisp of steam curls lazily above the volcano’s peak. The ground murmurs and groans. The mountain’s slopes bulge ominously. Is the volcano ready to blow? Or is it just restless, and years — or perhaps centuries — away from a potentially dangerous eruption? 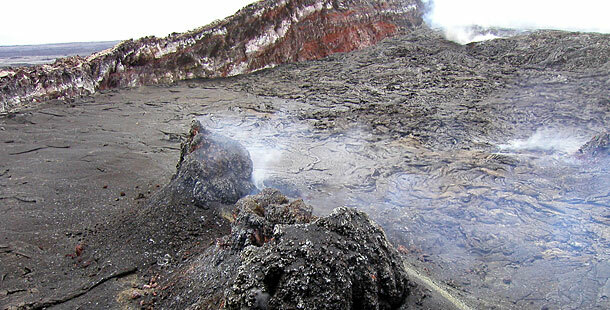 Scientists use tiltmeters to measure extremely subtle changes in a volcano’s slope. An increasingly steep side, for instance, can indicate a buildup of gas and molten rock inside the mountain, making it swell. Modern tiltmeters can detect a change of just one part per million; that’s equivalent to being able to detect someone lifting the end of a half-mile-long board just one millimeter — or about the height of a dime. 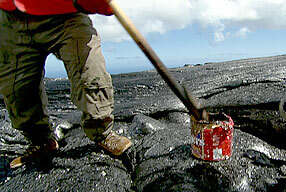 A geologist cools a sample of molten lava in a can of water. The gas emanating from a volcano’s vents and crater can tell scientists a great deal about what is happening deep beneath the earth. Changes in concentrations of carbon and sulfur gases might signal the arrival of a new batch of magma, or molten rock. The amount of malodorous hydrogen sulfide gas may also indicate an impending eruption. Obtaining gas samples can be dangerous. A spectrometer — an instrument that analyzes light coming through a volcanic plume — allows scientists to conduct a study from a safe distance. Since each type of gas emits its own distinctive light signature, researchers are able to identify what is coming out of the volcano. In 1991, such gas analysis tools helped researchers predict the eruption of Mount Pinatubo in the Philippines, saving countless lives. Special cameras carried by aircraft or satellites can take pictures of the heat emitted by volcanoes. These “thermal images” help researchers identify new lava flows (which are hotter) and older, cooler ones. Monitoring a mountain’s seismic activity was one of the first methods used to predict volcanic eruptions. An increase in earthquakes can be a sign of an impending eruption. Researchers use seismic monitors to track the many small tremors that occur around a volcano. Modern seismometers can record the intensity, escalation, and epicenters of earthquakes. In Hawaii, researchers have more than 60 seismic monitoring stations on the Big Island alone. Radar mappers carried by aircraft and satellites produce remarkably detailed three-dimensional maps of the Earth’s surface. They help researchers predict where lava flows might travel — or predict the path of the incredibly dangerous steaming mudslides produced by some volcanoes. Local officials can then use this information to evacuate threatened areas in the event of an eruption.